SOFT & HEALTHY MATERIAL - Our baby pillow is made of a 100% Soft Skin-friendly Cotton Cover and a Microfiber Filling, which is Breathable, hypoallergenic, Toxic-free, Phthalate-free, Latex-free, Formaldehyde-free, BPA-free and Lead-free, not treated with any flame retardants. Specially designed not to get lumpy while providing the premium comfort and supporting your children\'s needs. 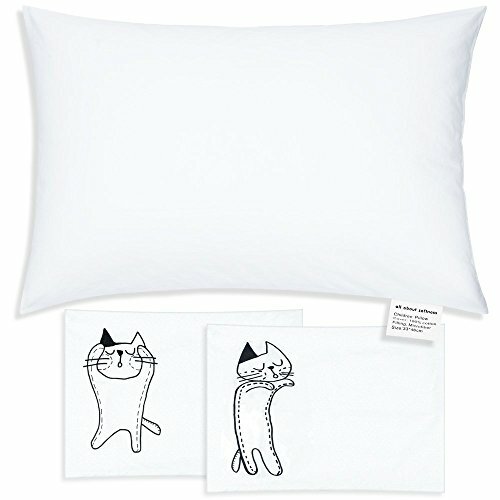 2 REPLACEABLE PILLOWCASES - We know that mess always happens with kids around, so we offered 2 machine washable pillowcases to replace, keeping your toddler\'s pillow clean and fresh while freeing your hands and always having a backup when an unexpected situation occurs. NO SMELL - We promise that you and your baby won\'t smell any unpleasant smell on our pillows and pillowcases, your little angel will sleep peacefully, which means you can sleep peacefully too. NO ZIPPER - Baby\'s skin is very delicate and can easily be scratched or pinched by the zipper, so we use a unique no zipper removable design, allows your child to play and sleep more comfortably and safely without the risk of scratching while keeping the fixed performance of the pillow. SIZE - 13x18 inches, not too small, not too large, not too fluffy, not too flat, just enough support for a toddler, suitable for age 3 to 9, perfectly for your little one to nap, sleep and play on bed, sofa or on the go. Of course you can also use it yourself if you want. My grandson loves his pillow! Love this pillow and the cases!